You know you have seen something special when the main point of contention is which player should get the mantle of Man of the Match. This became a major issue after the 4-0 walloping of Watford as Spurs continued the hectic Chelsea chase. Our webmaster Paul Smith allows you to take your pick of any of half a dozen candidates in his match report here, but another Smith � red-blooded Alan, once of Highbury fame and now Sky summariser � chose right-back Kieran Trippier ahead of two-goal Son Heung-min. For me, Sonny should have got the award. He might easily have had five goals and did the damage in the cauldron of the packed penalty area, while Kieran was allowed acres of space by an injuries-weakened Watford defence. Trippier is an accurate and imaginative passer of the ball, but I know that Kyle Walker would have been equally effective against a woeful Watford side that might easily have conceded eight goals. If you are wondering where I get the eight goals from just consider the two sitters missed by the seemingly jinxed Vincent Janssen, plus the shots from Son and Our Harry that visited the bar. 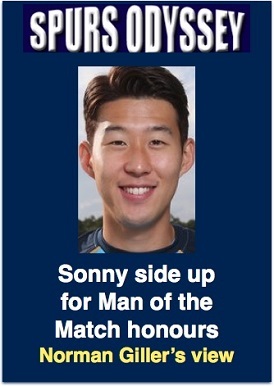 I just know that if Sonny had got the hat-trick he deserved he would have been a unanimous choice as Man of the Match, and his sunshine smile would have been visible from Seoul. The fact that Mauricio Pochettino brought him off two minutes from the end for the applause factor showed that he considered him worthy of being singled out. This was a magnificent team performance by Tottenham, inspired by that magical opening goal from the deliciously talented Dele Alli. But it was way OTT for some younger supporters to be shouting that this is the greatest Spurs side of all time. These are the fans who seem to think football started with the launch of the Premier League. I will continue to stand up for my golden generation, and must just remind you that the Push and Run, Double winners and the side of �67 were a bit special. Not until Pochettino�s Pups collect silverware can they be mentioned in the same breath as the Burgess Boys, Danny�s darlings or the Mackay Marauders. If you don�t know who I am talking about you need to learn your Spurs history before making wild claims. But what I will concede is that this current team is as easy on the eye as any of their post-war predecessors. They play a flowing football that could be set to music, not so much Chas �n� Dave as the pomp and circumstance of Elgar, with vocals, of course, by Spurs-spawned Adele. The FA Cup final is set for Wembley on Saturday May 27. Put that in your diary, just in case. I was awarded an on-line gold medal this week by the Just Giving website for my March donations to the Tottenham Tribute Trust funds. This is shared with those who have kindly bought my Spurs �67 book, with all profits going to the Trust to help our old heroes who have hit difficult times. Sales of the book have slowed to a trickle, but I am sure YOU as a regular Spurs Odyssey reader are going to get behind this great cause and help me get another gold award for April. I know I am an old nag, but I will continue to beat the drum for the players who are paying the painful price in their autumn years for their efforts on our behalf in the summertime of their lives. You can order a signed copy here http://www.normangillerbooks.com/spurs-67/4554925859. It is the perfect present for Dads and (definitely) Granddads, who remember the days when Spurs were FA Cup kings. Please reach into your Spurs soul (and pocket) and help our old heroes. Thank you. Email your answers, please, to SOQL34@normangillerbooks.com. 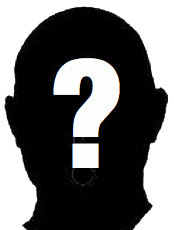 Give your name, the district where you live and how long you�ve supported Spurs. I will respond, and will email a screen version of one of my Tottenham-themed books to the sender of the first all-correct answer drawn at random. Deadline is midnight on Friday. A maximum three points in the SOQL table to those who answered Sandro and Internacional of Brazil. �The Beast� was establishing himself as a crowd favourite until a cruel injury that cost him his pace and then his place. He will always be warmly remembered by the Tottenham faithful. First name drawn at random from the correct answers is Bill Davis, from Ramsgate, who has been a Spurs supporter since watching Spurs win the first Uefa Cup final against Wolves on TV in 1972. I will be emailing Bill a screen version of one of my Tottenham-themed books.